We went to see the trailer. It's almost perfect except it has the smell that's been in almost all the trailers we've looked at. It's a sharp chemical smell that might well be headache and nausea inducing and I worry that it's indicative of some bad chemical outgassing. I can't tell if I'm overreacting or being justifiably cautious. I wouldn't want to spend over 30k on a trailer, move me, my kid and all my stuff into it and then discover that living in it makes me sick. But it's so close to perfect. I'm thinking about it. I told the sellers I'd let them know by Monday afternoon. 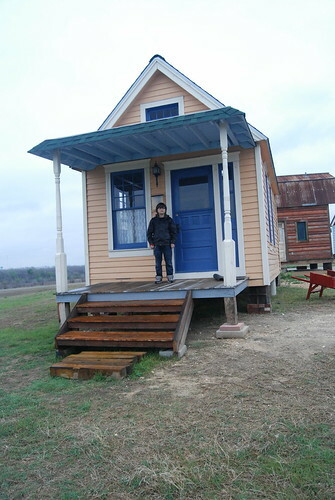 After we looked at the trailer, we went to Tiny Texas Houses. The houses are really cool and the space is much more livable than I had imagined. But they are really set up for one person or a close couple, not for a mother and son. Also most of them smelled musty to both me and G. But they were cute as could be. Click the photo below to see a slide show from our visit. 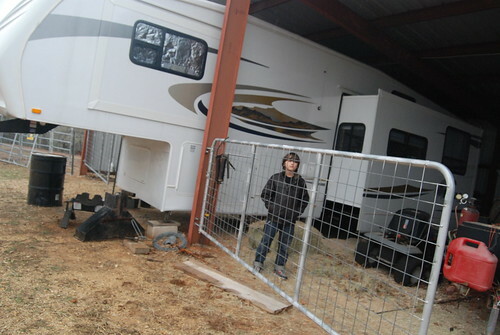 Modern trailers are mostly built of plastics and fiberglass, interiors finished in artificial stuff that does outgas. If you can keep the windows open a lot, much of that will dissipate, but the source is still with you. Do remember, whether with trailer or tiny house, you must have solid tiedowns. I do not want to be the one identifying your bodies when a big windstorm dumps your trailer somewhere else, like in the river. I'll do my best not to provide you with that opportunity in spite of the fact that I know the writer in you would be utterly fascinated by the actual experience of identifying a body or two. I am so jealous now. I thought of you the whole time I was there. If you ever come to visit I'll take you there. Forget tiedowns. Pontoons and a parachute. Or something like that. I love the tiny houses although it looks like you bathe in a whiskey barrel but they have a gigantic fitness room. They are sweet looking though. I love the tiny houses! Especially when it looks like you are approaching a little village of tiny houses. They are a lot like the <http://www.tumbleweedhouses.com/>Tumbleweed houses </a>but the Tubleweed ones also have an option for an add-on bedroom. Maybe Texas Tiny Houses will make you one with the kitchen/bath arranged so there can be a door to an addition. Or maybe get one tiny house with bells and whistles (ie bath and kitchen) and a second tiny tiny one without, as a second bedroom, and attach them with a breezeway. Tumbleweed has some tiny tiny ones that are trailerable; does TTH? PS I replied yesterday but it didn't show up. And now I'm being asked if I am a human. Something new?